Pre-heat the oil in skillet over medium heat. Sauté the onion and garlic for five minutes, then incorporate the apricots, lemon zest, cinnamon and couscous. Season with salt and pepper as desired. Next, pour in the hot broth and turn off the heat. Cover the skillet with a lid and let sit for seven minutes. Stir-in the sweet corn and garbanzo beans using a fork to ‘fluff’ the couscous. Adjust the seasoning as needed and sprinkle with basil. Serve immediately. You can also add other herbs or seasonings to pair better with the main dish in your meal. In place of corn and garbanzo beans, try using a defrosted bag of mixed vegetables. End-of-year dinners, especially Thanksgiving dinners, are famous for the amount of food everyone eats without caring about combinations or calories. An abundance of variety is important as well as being able to have a good time alongside family and friends–the central part of this jovial celebration. I have always liked to experiment with different ingredients in my meals, and Thanksgiving is no exception. But to tell the truth, I'm not a real fan of serving a stuffed turkey; I would rather serve the stuffing as a separate side-dish to keep the turkey lighter and tastier. 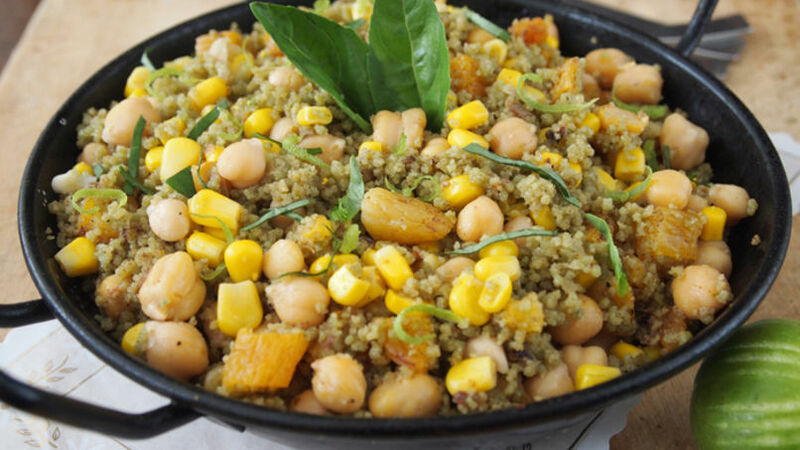 This presents the perfect opportunity to serve a unique type of 'stuffing' such as this vegetable couscous with apricots. Couscous in general is very simple to make and can be prepared quickly since no cooking is necessary. Just hot liquid is required, such as water or both, then cover and let sit for a few minutes. In the end, the grains absorb the liquid to form a light, fluffy texture–a delicious addition and interesting conversation point for any Thanksgiving meal. To speed up preparation, only use quality frozen vegetables to preserve the rich flavor of this recipe without sacrificing extra time in the kitchen. In this busy age, you can't afford to forget any time-saving shortcuts!